In January 2010, in response to the emerging tragedy from the earthquake in Haiti, Radiohead performed before a limited audience at a charity concert in the United States. Since that performance, footage of the event has been painstakingly compiled by fans and now a twin DVD has been released, endorsed by the band. All proceeds are going to charity and the fastest way of acquiring it? BitTorrent of course. In 2007, UK band Radiohead went against the grain by offering their latest album to the masses via the Internet in a pay-what-you-want model. Their seventh studio album, combined physical and digital sales went on to break the 3 million copy barrier. Now the band are back supporting a similar but completely altruistic model, this time for a DVD. 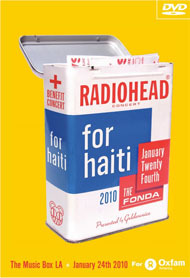 In January 2010, Radiohead performed at the Haiti Relief concert at the Henry Ford theater in Los Angeles and the event was filmed and its audio recorded, not by the band or show organizers, but by their fans. Understandably, that footage went on to be scattered far and wide but thanks to the work of three fans – inez, formengr, andrea – the video and audio has been painstakingly collated to make a two DVD set of the event, which was limited on the day to just 1,400 people present. The trio then decided to make the work available on the Internet for the masses, but supported by a great idea to help those in need. “It was a SPECIAL show with a SPECIAL purpose – to raise badly needed funds for those who lived through the devastation. And it seemed only appropriate that the DVD should carry on some of these goals,” inez explains. So plan in hand, inez approached Radiohead for their approval and to find out which charity they would like donations to go to. The band chose Oxfam to handle donations on behalf of Haiti. Normally with a charity product a whole bunch of funds would go to producing a physical product and then getting it delivered all over the world, but with the magic of BitTorrent none of that is necessary. In fact, even the online distribution costs come to almost nothing meaning that every penny goes in the right direction. Inez has chosen a handful of trackers to distribute the DVD including the signup only Zombtracker and the one the majority of BitTorrent users will recognize, KickassTorrents. The official Oxfam donation link can be found here and a copy of the full video can be seen on YouTube, linked below. Please download and give generously.